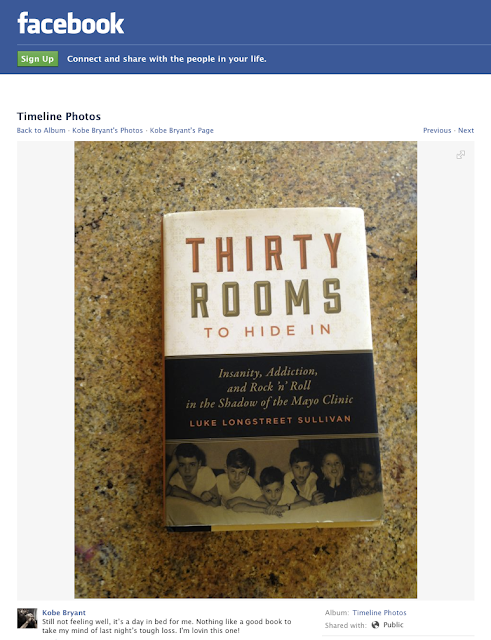 UMP | University of Minnesota Press Blog: Who's reading "Thirty Rooms to Hide In"? Well, Kobe Bryant, for one. Who's reading "Thirty Rooms to Hide In"? Well, Kobe Bryant, for one. Today, UMP got a nice thumbs-up from Kobe Bryant. Recommended: Thirty Rooms to Hide In: Insanity, Addiction, and Rock 'n' Roll in the Shadow of the Mayo Clinic by Luke Longstreet Sullivan.